Whew! That was a busy weekend, what with celebrating Olivia's 12th and performing in the Missa Gaia concert on Saturday and Sunday, and I simply didn't get a chance to post about it earlier, so here I am, playing catch up. 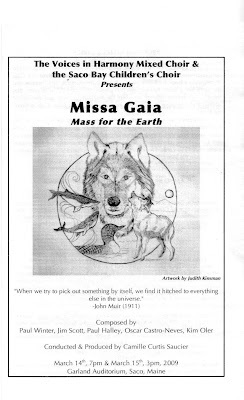 This was our second time singing the Missa Gaia as a family, and the choir director (and friend) plans to make the performance a bi-annual event. The last time we sang it, Adam was not yet in the children's choir so he sang in the adult choir instead. This time, both Olivia and Adam were in the children's choir. I wish I had video to share, as watching Adam sing with his entire body and soul brings us, and many folks, given the comments we received following the concert, such joy. That child of ours literally sings with his whole heart. Olivia is also expressive in her singing, and her face lights up with every note of music. And then there was Mr. Bradstreet; I always knew Alex had a good singing voice and perfect pitch but he surprised even me when he auditioned for the Kyrie solo. He sounded wonderful during the concerts. Alex also took on the additional challenge of singing tenor instead of bass like he did two years ago, and since some of the tenor notes were higher than the alto notes, this wasn't an insignificant challenge. I sang alto again, which is challenging for me after years of choral experience singing soprano (and the melody) since I learn by ear. I think it's good to give our brains those sorts of exercises, not to mention our voices. There are so many wonderful things about singing the Missa Gaia, among that list would be working with the director, Camille Curtis-Saucier, the musicians, fellow singers and learning this exquisite and unusual choral work. I'm certain we'll perform the Missa Gaia as a family again in two years, hopefully feeling a bit more experienced and always inspired by the music. so wonderful to hear about your weekend. btw, love your new photo on the top. nice and happy and springy!